PartyPoker Pro and poker host Kara Scott has become a fiancée after accepting a marriage proposal from her partner, Giovanni Rizzo. Scott and Rizzo had been dating for more than a year and had recently been competing at the World Poker Tour Venice Grand Prix where Scott finished in a respectable 13th place. The €7,200 Scott won pales into insignificance now that Rizzo has asked for her hand in marriage in romantic Venice where they had shared their first kiss. This is the second major step the pair have taken together. 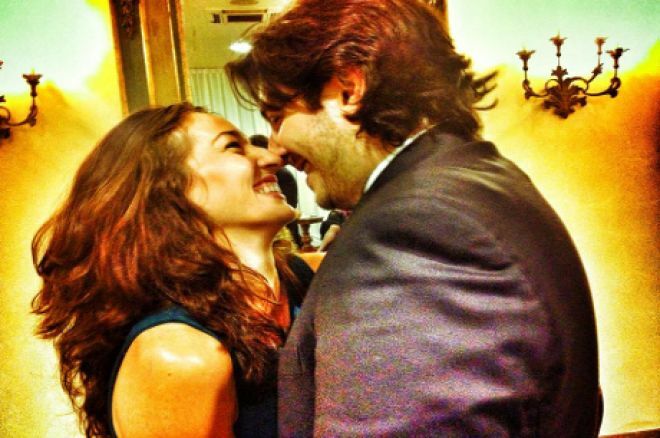 They recently moved into a home in Rizzo’s native Italy, and PokerNews is sure everyone in the poker world wishes the happy couple happiness and the best of luck for the future. Readers will be able to learn more about the engagement when Scott updates her PartyPoker Blog. Both Scott and Rizzo are heavily involved in the poker community. Scott is a PartyPoker sponsored pro who divides her time between playing poker and hosting the biggest poker shows the industry has to offer. Her largest cash to date tops the scales at €312,600 — her reward for finishing second in the 2009 Irish Open. Rizzo is a Gioco Digitale — a bwin-owned Italian poker site — sponsored pro who specializes in cash games, but who also has a number of impressive tournaments results on his résumé. Those of you who tuned into the coverage of The Big Game in 2012 will have heard Rizzo's dulcet tones throughout the 48 hours the cash game ran. Having personally worked with Kara and spent time with Giovanni on various poker circuits, I can honestly say these two people are two of the nicest and genuine people you are ever likely to meet, and if anyone deserves to spend a long and happy life together, they do.